K 1914 Goodwick Brick Works Co Ltd.
K 1923 Goodwick Brick Works Co Ltd and 48,49 and 50 Pembroke Buildings, Cambrian Place, Swansea. Cope 1931/2. Goodwick Brick Co. Ltd. Goodwick. ID 52 British Anthracite Sales Ltd, Gloucester Chambers, Swansea. Clay 61 British Anthracite Co Ltd, Goodwick Brick Works, Goodwick. D&P 202 - Started before 1910, with a siding to GWR. Possibly initially involved with the GWR who built over 100 dwellings in 1907 on land overlooking the harbour. Sidings on the down side. Narrow gauge in the quarry behind (SM 938378). 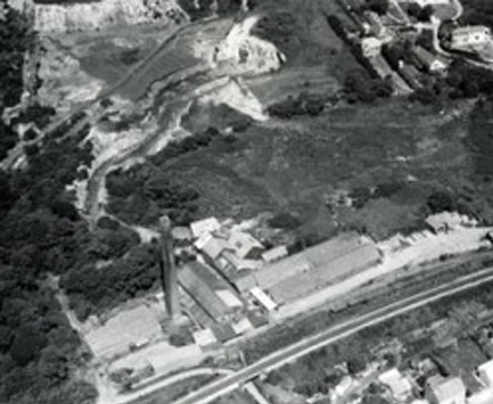 Works closed and demolished with chimney felled 12/1969. 2ft gauge Ruston & Hornsby 193973 new to works in 1938, scrapped c1970. BR connection closed by May 1965 and narrow gauge tramway disused by June 1969.